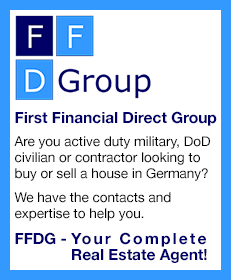 The US Forces in Germany issues drivers licenses and registers privately owned vehicles (POVs) for its military and civilian personnel and their family members. The following applies only to Germany, but the rules are very similar for other overseas US Forces. For very detailed information on POV registration and other motor vehicle topics go to this link. To apply for a license you must go to your local Driver Testing Station (DTS) and present an approved AE Form 190-1T, a U.S. Forces identification card and a valid stateside driver's license. There is no road test for people with a stateside license, but they must attend a two-hour driver orientation. Most applicants will also need to pass a hundred-question written test. Only people with a valid license from either the host nation or another U.S. military command in Europe are excused. To bone up on the test you should study the Drivers Handbook. Click here to download a copy of the Driver's Handbook and Examination Manual. Applicants who fail the written test twice will be ineligible for retesting for two weeks. If they fail it a third time, they will be declared ineligible for retesting for 60 days and must complete remedial driver training before retesting. There is also an eye test, conducted mostly by DTS personnel. Applicants over 65 must have an optometrist certify that their vision is satisfactory. The minimum age for getting a U.S. Forces drivers license is 17. Any restriction on a 17-year-old's stateside license (accompanied by an adult, no night driving, etc.) also applies here. If the 17-year-old has no stateside license, he can attend a German Fahrschule and acquire a German Prüfbescheinigung with a number of similar restrictions. This is also recognized by US Forces. Special rules apply to motorcyclists. Applicants must have a valid stateside or host nation license specifically stating that they may operate motorcycles. Those who don't must obtain such a stateside license or pass a host country course, taken at their own expense. Even if they have a valid motorcycle license they must take an orientation course, and pass a written test and road test. Exact details of this differ somewhat between the services. Individuals who have lost their driving privileges for any reason will be prohibited from driving under any circumstance until their driving privileges have been restored. In addition to your USAREUR license, it's a good idea to have an International Drivers License. You need it to travel to Switzerland, Austria, Greece, Spain, and all Middle Eastern countries, and it's a good thing to have whenever you travel outside Germany. You can get one from the German authorities for between 12 and 20 euros. The DTS can tell you where to go. Take along your USAREUR license and two passport-size photos taken in civilian clothes. Civilians and family members also will need their passports. All vehicles within the command must be registered by the command. 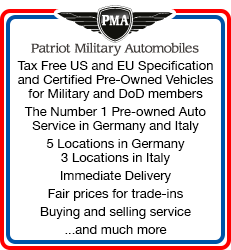 That includes vehicles brought from the states, vehicles purchased over here and vehicles being transferred from other U.S. commands within Europe. Commanders may permit new arrivals to drive their POVs in Germany for 30 days without a US Forces license, provided they have a stateside license and, based on their position or age, are considered to be mature and responsible. The car is registered at your local Field Registration Station (FRS). As a rule only sponsors, not family members, may register a vehicle with the military in Europe. Powers of attorney will be accepted only if the grantee is the spouse of the registrant. Personnel with their families in Europe may register up to three POVs; unaccompanied personnel are limited to one. Commanders may waive these restrictions under some circumstances. To register a car with the military an applicant must provide proof of ownership, show that the car has passed a mechanical inspection fewer than 75 days previously, and prove that there is valid third-party liability insurance. An Insurance Confirmation Card (ICC) from an authorized insurance company is the only acceptable proof of insurance for registration. The car must also have a first-aid kit, and warning triangle to be put out whenever a car is stalled in a traffic lane. Inspectors will examine the engine, chassis, frame and all other components, including brakes, tires, horn, wheel alignment, windshield, lights and mirror. POVs must meet the minimum standards of exterior condition acceptable in the military and civilian community. Deficiencies such as extensive body damage, missing component parts, deterioration, worn or bald tires, inoperative lights, broken windshields and dangerous projections caused by rust may prevent registration of a POV. Obscene bumper stickers or other signs are not allowed. Vehicles that fail inspection usually do so because of rust or faulty lights, exhaust, brakes or tires. Registrations are good for 24 months. The car must be reinspected in order to get a renewal. Cars more than six years old must be inspected annually. License plates now are standard German plates; part of an effort to lower the profile of the US Forces. They will be issued for the vehicle specified on the POV registration certificate and may not be transferred to any other vehicle. A verification decal will be issued with each set of plates and must have the same number as the plates. The decal must be permanently affixed to the bottom-left corner (driver's side) of the windshield.